It's destined to appeal to younger drummers with punk-metal heroes who are mostly not awash with dosh. The addition of Evans heads is a quality touch and the drums are sonorous and warm. The snazzy finishes, staggered lugs and black hardware all add to the feeling you're getting something a bit different and exclusive, although current limited set-up options may be a drawback. Comes with quality Evans heads. A tasty looking buget kit. Limited set-up options. No snare/cymbal stands or foot pedals. The big kick would suit a power rock or, dare we say it, ballad type of band. The kit features mahogany shells and gentle 30 degree bearing edges. The deep wooden snare has a dense tone with lots of after-ring and lively rim shots. The small tom comes with its own mini GTS isolation mount. The shells are nine-ply Philippines mahogany. The Catalina Club range is made in Taiwan, immediately making it cheaper than Gretsch's USA-built pro drums. The lugs on the toms are staggered in a zig-zag pattern. These days, given a cursory glance, some budget kits look more like their pro brethren. Take the Catalina Club Mod, for example: it's just one up from Gretsch's entry-level Blackhawk. 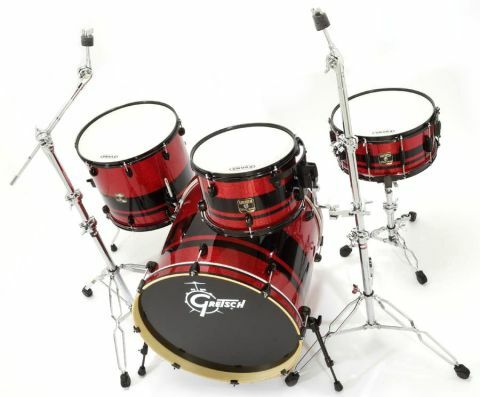 But looking at this latest Club addition, with its massive bass drum, striking finish and trendy, off-set lugs, you'd be forgiven for thinking you'd missed a few pages and landed in the more professional end of the Gretsch catalogue. How do they do it? Let's check the build more closely. The Catalina Club range is made in Taiwan, immediately making it cheaper than Gretsch's USA-built pro drums.The shells are nine-ply Philippines mahogany, that old staple of budget drums. They're smoothly sanded inside, and have gentle 30 degree bearing edges rather than the more familiar 45. The inner ply runs vertically, which is becoming more common these days and aids projection. The snare drum has proper snare beds and the strainer has a nylon silencer. There's just the one set-up which reflects Mod trends with an over-sized kick, deep snare and relatively small toms - a traditional 12"x8" and a 14" shallow, 16" diameter floor. However, there is a Mod alternative, the Mod Funk - smaller all round, with 10"x7" and 14"x12" toms, 13"x6" snare and 20"x20" bass drum, plus an optional 12"x8" add-on tom. The snare has 10 double-ended lugs, while the lugs on the toms and kick are single-ended and staggered in a zig-zag pattern, again following a current trend. There are arguments both for and against, Constructionwise. One says it offsets the stress around the shell, the other argues that it adds a slightly upsetting pull/stress on the shell. Our guess is it makes next to no difference and it's just a cosmetic thing. Metal work, including the standard gauge triple-flanged hoops, is powder-coated in black. The bass drum hoops are maple and inlaid with the red glitter - a quality touch. The small tom comes with its own mini GTS isolation mount, again in black powder coat, plus clamp for mounting off a cymbal stand. Note that aside from the GTS mount/clamp, bass drum spurs and the sturdy floor tom legs, no other hardware comes with the kit. That is, no snare/cymbal stands or foot pedals. The mahogany shells and gentle 30 degree bearing edges mean the sound is always going to be warm and deep. The toms and snare come fitted with professional Evans Genera G1 Coated batters, the coating slightly darkening the attack. Fitting pro heads to a budget kit produces an excellent sound, indistinguishable from that of a kit costing twice as much. Including a deep wooden snare adds even further to the warmth of the kit. The shell has a dense tone, not so crisp as metal but with lots of after-ring and lively rim shots. Cross-sticks suffer slightly, though, as they're a bit subdued. The small tom was classically fat, immediately agreeable after the quickest of tune-ups, while lopping two inches off the floor tom depth (it's 14" rather than 16") gives it just enough extra bite to counteract the softer timbre of the mahogany and 30 degree edges. The bass drum has Taiwanese Remo-style clear batter and black logo heads with two-inch head are only just enough to get the wrinkles out without having to overtighten the batter. Tuning felt a bit sloppy until the head was well seated, evened up and played in. The big bass drum suggests loud, metal, punk and thus fast pedal work. Trouble is, the deeper the drum, the slower the response - and 20" is deep. With that in mind we tried tuning the batter higher than normal, more in the middle range than with just the wrinkles taken out. Eureka. Because the internal volume is so huge you can do this and still get a chestthumping sound. The big kick would also suit a power rock or, dare we say it, ballad type of band, where a deep, fat and lengthy kick note will fill out the big spaces well.